(Newser) – Trim your hair, your beard, your blood pressure? Black men reduced one of their biggest medical risks through a novel project that shows the power of familiar faces and trusted places to improve health, per the AP. The project had pharmacists work with dozens of Los Angeles barbershops to test and treat clients. The results, reported Monday at a cardiology conference, have doctors planning to expand the project to more cities nationwide. The new work involved 303 men and 52 barbershops. One group of customers just got pamphlets and blood pressure tips while they were getting haircuts. Another group met with pharmacists in the barbershops and could get treatment if their blood pressure was high. 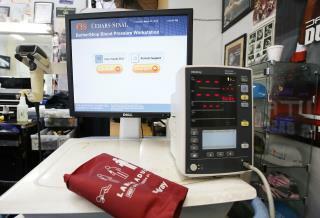 JustAmere observation: These blood preassure machines I have seen and used in several different privately owned stores. Thinking am I of other places to place them. Airports, car dealers, Timeshare presentations, recently redefined restrooms and our computors when we read news blogs. Stuff like that. Was considering including Government offices. Rethink do I, that possibility. Somehow should Government get involved in said blood pressure machine placement efforts, that a way to reduce our freedoms will be created. Hmmm, I would say more stuff here, but I just had a blood pressure machine delivered while writing this note ----- by Homeland Security. I anticipate a bunch of blood test machines going up for sale on Craigslist or eBay.